Estimation of Distribution Algorithms: A New Tool for Evolutionary Computation is devoted to a new paradigm for evolutionary computation, named estimation of distribution algorithms (EDAs). 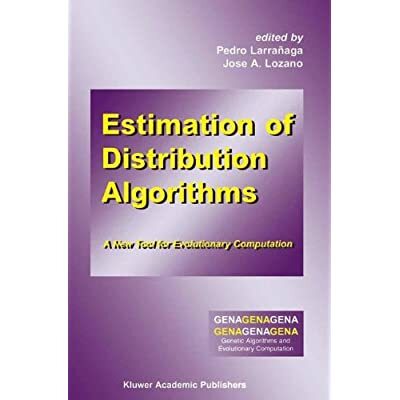 This new class of algorithms generalizes genetic algorithms by replacing the crossover and mutation operators with learning and sampling from the probability distribution of the best individuals of the population at each iteration of the algorithm. Working in such a way, the relationships between the variables involved in the problem domain are explicitly and effectively captured and exploited. This text constitutes the first compilation and review of the techniques and applications of this new tool for performing evolutionary computation. Estimation of Distribution Algorithms: A New Tool for Evolutionary Computation is clearly divided into three parts. Part I is dedicated to the foundations of EDAs. In this part, after introducing some probabilistic graphical models - Bayesian and Gaussian networks - a review of existing EDA approaches is presented, as well as some new methods based on more flexible probabilistic graphical models. A mathematical modeling of discrete EDAs is also presented. Part II covers several applications of EDAs in some classical optimization problems: the travelling salesman problem, the job scheduling problem, and the knapsack problem. EDAs are also applied to the optimization of some well-known combinatorial and continuous functions. Part III presents the application of EDAs to solve some problems that arise in the machine learning field: feature subset selection, feature weighting in K-NN classifiers, rule induction, partial abductive inference in Bayesian networks, partitional clustering, and the search for optimal weights in artificial neural networks. Estimation of Distribution Algorithms: A New Tool for Evolutionary Computation is a useful and interesting tool for researchers working in the field of evolutionary computation and for engineers who face real-world optimization problems. This book may also be used by graduate students and researchers in computer science. `... I urge those who are interested in EDAs to study this well-crafted book today.' David E. Goldberg, University of Illinois Champaign-Urbana.